We live in a world where we all have super tight schedules and no room to fuss around with our fitness, yet we start to realize how essential it is to make self-care a priority and to aim for a healthy, fit and lean body. A healthy mind thrives in a healthy body, right? That’s why I’m absolutely in love with Pareto’s 80/20 principle. Applied to your fitness routine, it means that 80% of your training results comes from 20% of your training effort. 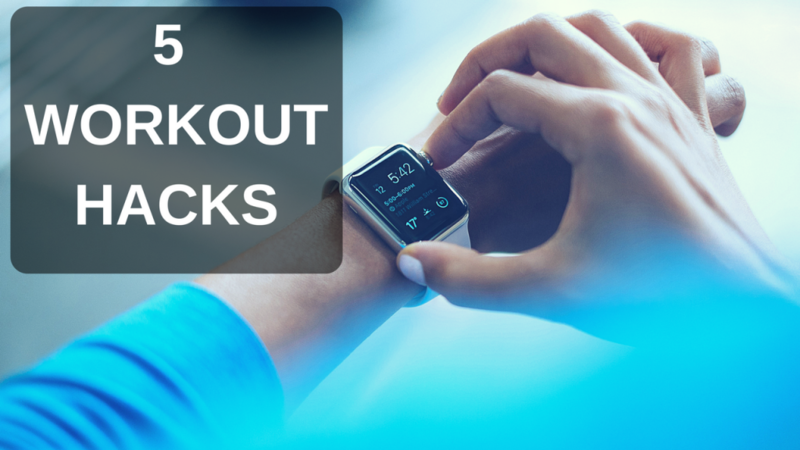 I’ve been researching and playing around with optimal training time and efficiency for a long time and here are my top 5 workout hacks for passionate boss ladies. I designed all my workouts following the principles of High-Intensity Interval Training. A training form that increases the metabolic rate during and after the workout and maximizes calorie burn. It does this by a combination of full body moves which are performed at a high intensity with very little rest periods in between. In other words, you’ll be working as hard as you possibly can for a short amount of time, resting, then working hard again. That’s why an entire HIIT session usually only lasts for about 10 – 20 minutes. Due to the high intensity of the workouts, your muscles need time to recover in between the sessions. This is why I wouldn’t recommend training more than three times per week because your muscles grow actually during the rest periods in between. We aim for muscle growth because they’ll speed up your metabolism, protect your bones, ligament, and tendons and help your body to keep fat off and stay lean. Speaking of efficiency, I highly recommend integrating full body exercises like Squats and Push-ups in your workout routine. They work more than one muscle at the same time, are functional and time efficient. They are defined as ‘functional exercises’ and help you improve your ability to perform everyday tasks, build strength and balance, and augments your ability to injury. Exercises like Squat jumps and scissors are considered as Plyometric exercises. They’re designed to improve the function of the nervous system and produce fast powerful movements. Through a specific stretch-shortening cycle of the muscle fibers, they improve the muscular contraction, in other words, you get stronger, fast. Plus, because of excess post-exercise oxygen consumption (EPOC), plyos produce an effective calorie burn for hours after the workout. I suggest you start adding only one plyometric exercise to your regular workout and increase with time. Ever paid for a gym membership and never set foot in it ever again? I’ve been there too and you’re not the only one. Gyms are not only costly, they’re also impractical and a waste of time. Just think about how long you need to get there, change, workout, shower and drive back home again. Working out at home isn’t only cheaper, it’s more effective, simpler and less time consuming as well. Just make sure to challenge yourself and perform your workouts in the most effective way. You’ll do five different full-body exercises, like squats, burpees, and pushups and perform each exercise at maximum effort for 20 seconds followed by 20 seconds rest; in total, you’ll do that for six rounds. Simple, yet most effective. I absolutely love to train my clients and myself following the above principles because it gives you the freedom to workout anytime and anywhere and simplifies your life tremendously. Remember, it’s all about training the smart way, not the hard way! You don’t need a gym or any equipment, you only need some space in your living room, some guidance and an efficient workout plan to follow. Perfect for busy people. Did you know? It's actually 80% nutrition and only 20% training when it comes to getting back in shape and losing weight the healthy way. You can never ever out-train a bad diet! It's my very first one live from Bali and I'll share with you all my secret healthy eating & effortless weight loss tools, that I'm successfully using with my clients. It's easier than you may think.